Software-defined data center (SDDC) architectures promise the added functionality needed to keep up with modern data demands, but selecting an SDDC platform requires careful planning and a thorough technology evaluation. Before purchase, IT professionals need to consider if the benefits – automation and reduced data bandwidth – are worth the drawbacks of startup costs and scalability. 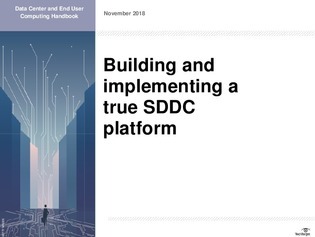 In this handbook, find out what it takes to build and implement a software-defined data center platform – from initial deployment considerations to selecting the proper GPUs and FPGAs.